You’ve lived in your apartment for years. It no longer lives up to your expectations. In fact, you’re embarrassed to invite friends over because you’re not that proud of your place. Sound familiar? Don’t worry, you’re not alone. If you’ve lived in your apartment for a few years (or more), it’s completely normal to have those feelings. What was once a great place for you has become a sub-par option that you know you need to leave. So why do you stay? If you’re thinking about making a move, it’s important to think about why you’ve stayed there so long in the first place. 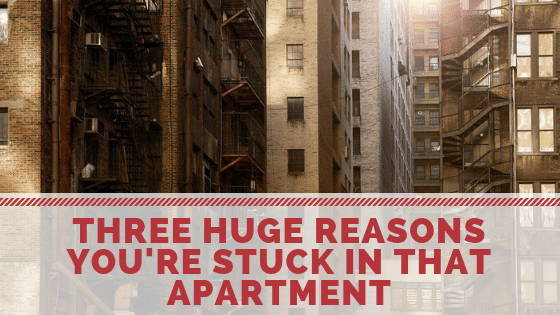 Here are the three main reasons you’re stuck in your apartment and what you can do about them. Being comfortable has its benefits. If you’ve lived in the same place for more than a few years, there’s a good chance you’re pretty comfortable there. But when comfort turns to complacency, it’s all downhill from there. If you move, you might have a longer commute to work or school. You might need to buy some new furniture. You might need to downsize and get rid of some of what you’ve amassed over the years. And the thought of packing boxes and actually moving – well that’s just might be more than you’re willing to handle. The problem is, if you truly want to make a change, you have to face it head-on. Start by making a pro and con list of all the reasons you want to leave and all the reasons you want to stay. Sometimes, seeing it written on paper can be the inspiration you need to make a change. Leaving your comfort zone can be hard to do. But if it’s really time to make a change – and you know when that is – you have to put yourself on the right path. Everyone has a budget, so it’s valid to feel some concern over what the cost of moving will be. If your goal is to upgrade to a bigger apartment or move to a better neighborhood, there’s a good chance you’ll have to pay a little more than you’re used to. But it doesn’t have to cost an arm and a leg. Are you willing to move a few miles away from your favorite downtown area in order to have your dream apartment on the outskirts of town? Can you spend a little less money on entertainment or dining out? Can you curtail your online shopping habit a bit? Are there other expenses you can cut back on in order to put more money towards the rent? Before you make your move, think about where you can make some sacrifices. Think about what in your life needs to stay and what can go by the wayside. Refer back to your pros and cons list to decide what’s worth keeping and what you can live without. Being stuck and feeling stagnant in an old apartment can take a toll on you in more ways than one. Feeling stuck in your apartment can roll over to complacency at work and dissatisfaction with your social life. So decide what, if anything, you’re willing to give up in order to move to a better place. Moving to a better place can give you an entirely new perspective on life. And that can be more valuable than anything you’re currently spending your money on. If you’re ready to move into your dream apartment (or ready to put renting behind you and buy a home), it’s a good idea to reach out to your network. One of the main reasons why people often get stuck living in the same apartment is that they fail to make use of their network. Reaching out to the people you know can help facilitate change. Connect with people in your extended network that might be able to help you find your dream apartment. Do you have a friend from college or an old coworker who lives in the complex you want to move to? A simple referral from a current tenant can move your name to the top of the list of a highly sought-after place that can take years to secure. Having that referral might even be able to get you a discount on your rent for the first year or first few months. And that discount can make your entire move a bit more affordable. If you currently live alone, it can be tough to make the decision to move in with roommates, but it might be worth your while. Sharing an amazing new two-bedroom apartment in a great complex may be a better choice than living in your current apartment alone. Reaching out to your network can help you make the connections you need or find a great roommate looking to make a similar move as you. It’s easy to become complacent – in your job, with your friends, and especially in your old apartment. But when you can’t stand the sight of the same four walls or feel ashamed to invite new friends over, it’s time to make a move. But all the reasons why you’re holding onto your old place are easy to overcome. Get yourself out of your comfort zone. Prepare yourself to deal with a longer commute, spend a few more dollars on rent, or move out of the neighborhood you know and love. Make a pro and con list to weigh your options. Make a few sacrifices so you’re able to pay for your new apartment. Think about where you can cut back and make the commitment to do so. Reach out to your network. By asking friends or coworkers for assistance, you might be able to secure your dream apartment or find a great new roommate to help you afford the rent. If you’re ready to take a proactive approach to your living situation, get over these three hurdles. With a little bit of self-reflection and effort, you’ll be in a great new apartment in no time! In the second story of this series, we will discuss how throwing a party (yes, a party) will help you leave your apartment in style. Chestnut Portland is a quiet community of one, two and three bedroom townhomes in Portland and Scarborough, Maine. Chestnut Portland is perfect for anyone looking for easy access to town, as well as a little fresh air and breathing room.